« Can websites “buy” their way out of Panda? The problem here might sometimes be related to a simple reason: your forwarding from old to new domains has not been implemented properly and thus you have an issue with backlinks that simply just fall short – and usually get re-directed to your 404 errors page. As a result of this your new structure might might not get the support of “deep link power” that it needs. Simply said: You have important backlinks for categories/sections missing which gave your website a higher topical relevance. A first sign here is an increase of hits on your 404-pages (can be seen through Google Analytics) and/or an increase in bounce rates (which obviously might also be related to other issues like your new design is not as much liked as you expected ). Also a drop of length and depth of visit from direct visitors might be an indicator. The all-time classic which shows the 404 sources of error and with a simple click on URL details. Here you can see whether the error stems from an internal problem or an external link gone astray . 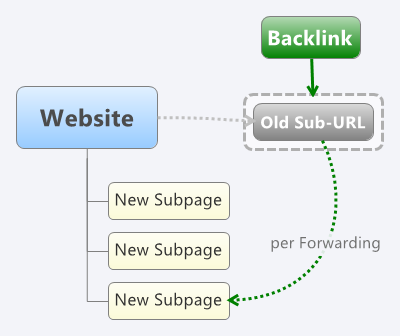 The displayed URL then can be simply used with a “Redirect 301 /old-url http://www.site.com/new-url” line in your websites htaccess file. Pick an appropiate page/section of your site and forward the external link to that target. Obviously do not forget to check the external link first for relevancy and anchor text.With the recent updates (like Webmaster Tools data in Google docs) Google has discontinued the complete download option of these error sources which in my opinion is a major deficit: you now need to go through EVERY SINGLE URL to figure out whether it is an internal or external URL which is quite virtually impossible for larger sites (I pointed this out at the Google GWT forum sometime ago, haven’t received any answer though). 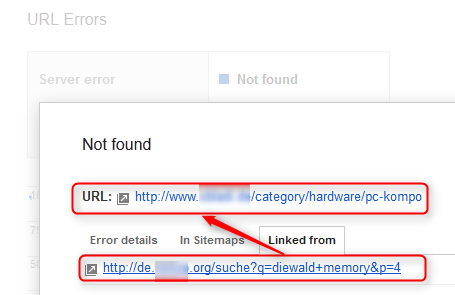 As I have said this before: I really like the WordPress Plugin “Redirection” – it’s such a valuable SEO-Tool and has one extra feature that will help you out if you don’t want to click through every result of Webmaster Tools: the logging module for 404errors.Here you can see when a 404 error had occured, what the targeted page on your site was and which site/IP address the origin was. 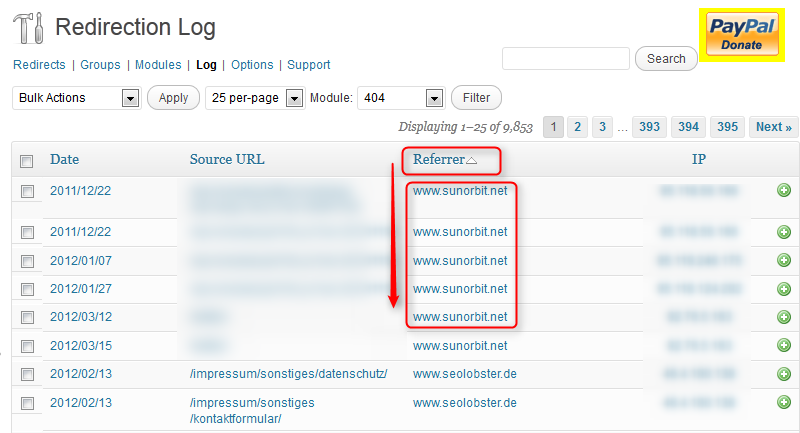 By ordering the errors via the “Referrer”-field you then can see where hits came from and get a quick idea if your site is missing out on backlinks.You can also go ahead and download the data as CSV or as XML-Feed. Personally I use the XML Feed and import into Excel via the “data import function“. This has the great advantage that you can update your excel sheet simply with one click and always have the latest 404s right in that document. Once you have implemented all your redirects you should still check your error log at least once a month: sometimes there might be still be broken links to images or other content (e.g. PDF Files) on your page. And checking your logs might help you to find some already existing link nuggets. This entry was posted in Backlinks, Google, SEO, Wordpress and tagged 404, 404 errors, backlinks, error log, forwarding links, htaccess, link power, Redirection. Bookmark the permalink. Post a comment or leave a trackback: Trackback URL.